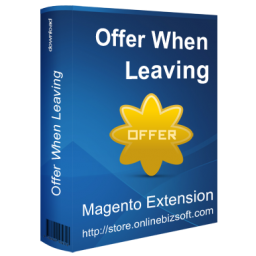 The Offer on Leaving is an interesting approach to give give your customers a discount or promotion offer before the customers leave your Magento store. The Offer on Leaving extension will show a nice Facebook-style popup when the customer exit Magento store or close website. This way you can set a discount to promote and get more sales if customers already added something to their shopping cart without checking out. It would be nice if your store use the Offer on Leaving extension with the Facebook Shop Publisher Magento Extension Absolutely increase your sales.